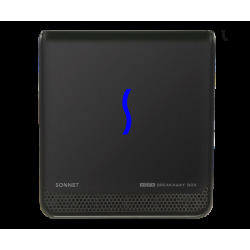 Sonnet’s eGFX Breakaway™ Boxes are a family of Thunderbolt™ 3 to PCIe card expansion solutions that support any Thunderbolt compatible PCIe card, but are designed specifically for bandwidth-intensive AMD and NVIDIA® graphic video cards. The eGFX Breakaway Box 550 features two 8-pin (6+2 pin) auxiliary power connectors and supports cards requiring 375W of power (equivalent to 600W recommended system power) – more than enough capability to support nearly every compatible GPU card, with the exception of ones such as the AMD Radeon™ RX Vega 64, Vega Frontier Edition, WX 9100, and overclocked NVIDIA cards with extremely high peak power requirements. Depending on your OS, there's a graphics card suitable for your needs. Sonnet’s eGFX Breakaway Box 550/RX 580 Bundle includes a Sapphire PULSE Radeon RX 580 8GB graphics card, providing GPU support for computationally-intensive applications and games on compatible Mac® and Windows® Thunderbolt 3 computers. Sonnet’s eGFX Breakaway Box 550/RX 580 Bundle includes everything you need to get started with high-performance graphics acceleration. Alternatively, if you need a cost-effective Thunderbolt expansion system for a Thunderbolt-compatible, non-GPU PCIe card (such as the Avid Pro Tools|HDX [power adapter cable sold separately] or RED ROCKET-X), simply swap out the included graphics card and utlize the Breakaway Box as a cost-effective single PCIe card Thunderbolt expansion system with your computer.